Ever since I became entranced by Coltrane’s song “India” in my bedroom when I was sixteen and living at home, I’ve been aware of the power of music to affect the heart, soul, and spirit. Music has always exerted a powerful force on me, even before I could really put its magic powers into words. It’s what moves the Sufis, enables fire walkers in Morocco to avoid getting burned, and is used in ritual trance ceremonies in Brazil, Cuba, Haiti, the Philippines, and many parts of Africa. Music is a hypnotic agent and healing elixir, and it has been for a long time. In preparation for a class I was about to teach a few months back, I did a lot of reading on music and the brain. I read Gilbert Rouget’s Music and Trance; Musicophilia by Oliver Sacks, and Daniel Levitin’s excellent study mentioned below. The Music Salon course was called: The Experience of Music: Search for the Sublime. In it we listened to ritual ceremonial music from the African diaspora, the Sufi dervishes of Turkey, qawwali music from Nusrat Fateh Ali Khan, and the amazing Kecak trance music of Bali. It was very fulfilling for both me and the class members. This was not long after an amazing find: the discovery of a prehistoric bone flute over 40,000 years old, in Germany. 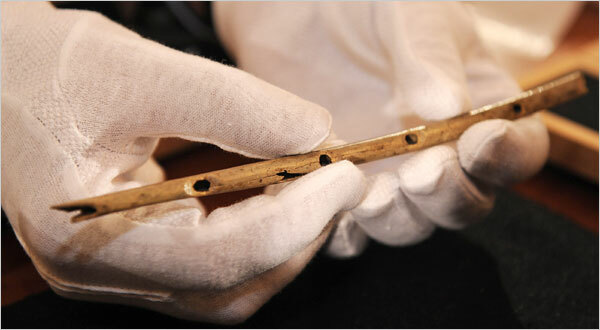 The archeologists who discovered it found something astounding: that it had been drilled with precisely placed cylindrical holes, presumably to allow its player to produce organized sound. So it seems that even Neanderthals enjoyed music, and it wasn’t just to keep saber-toothed tigers away at night but also to produce pleasurable sounds. But it did even more than provide pleasure. Daniel Levitin, a Canadian cognitive psychologist and melomane (music lover), asserts that music preceded speech, not the other way around (as is often thought). In his book This is Your Brain on Music, he says that this primordial music-making actually helped build new neural pathways and synapses, allowing those early hominid brains to grow and allow complex speech patterns to develop. It was a way for primitive man to organize an otherwise chaotic universe into a realm of order and regularity. It also helped the brain develop into the amazingly sophisticated organ it became, allowing humans to go to the top level of primates. We see this the other way around, in the way music therapy helps people with brain injuries recover. Melody Gardot is a good example. She was severely injured by an SUV while riding her bike, and completely forgot her music education and performance skills. Music helped her brain heal and make music again. Similarly, music is now used extensively among Alzheimer’s patients in helping slow the degeneration of this terrible disease. For me music has always been primal, the queen and king of all the arts. It involves us in ways that books and paintings don’t. Who dances in front of paintings or sculptures? And that is, for me, why it will always be on top.